I just gave you ice cream. Like, 3 days ago. I didn’t really want to do this. I wanted to keep variety and save this for another time in the future. But I can’t keep it to myself. This ice cream inspired me beyond belief and I want to share it with you right here, right now. Even if most of you are probably in fall-baking mode. This is the third time I make Ice cream and this time it blew my own mind. This is one of the easiest, yet, most interesting and complex-tasting ice creams I have ever tasted. I don’t know how to explain what I just said, so maybe I should tell you the name is Cookie No-Dough Ice Cream w/ Sour Cream Chocolate Ganache. My heart flutters when I hear/write/say those words together. Can’t you tell I like to spill things? And the ganache with the ice cream, ohdearsweetjesus I don’t think I’ve ever made something I liked better than this 2 things together. Listen to me here please. Forget everything I have ever asked you to make in this blog. Forget it. Done? Okay. Now this is the deal…You NEED to make this. I’m not playing games here, this is pretty serious business…You can’t even being to imagine how good the sweetness of the ice cream goes with the tanginess and slight bitterness of the ganache. Oh, and since I knew the ganche would be too strong, I added brown sugar to it. Yes, I went here and is the best thing that’s ever happened. It rounds everything out, since the ice cream is made with brown sugar too. 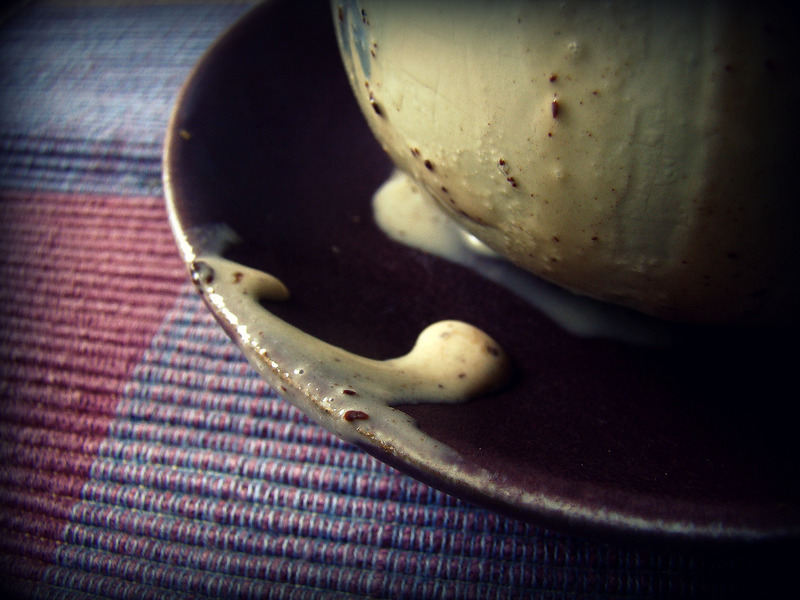 It takes a perhaps too sweet, creamy, velvety ice cream to new unknown levels. Is gorgeous, is like nothing I had ever tasted. I admit this ganache is not for everyone…I mean seriously, this is dark. I used 70% bittersweet El Rey Chocolate. I guess you could try this with semi-sweet or another type of chocolate, but it wont be the same. I beg you to try it with bittersweet chocolate before deciding you don’t like it. A little goes a long way, and I’m imagining this would go wonderful with cream-based Ice creams such as plain vanilla, banana or caramel ice creams. Trust me there’s nothing boring or plain about this. I was really upset the day I made this. So stressed out, so annoyed by some people. I was mad at boy. Boys usually make me mad, but at the end there’s no much you can do. When it was already dark outside, I sat in my mom’s bed (my favorite bed) with this baby and a spoon. Literally, everything else just melted away, I just wanted to eat this forever. With my tiny spoon. It was gorgeous. This thing alone inspired me to make ice creams more often. And is getting cold around here. Oh well…You really need to make this. Really. Really. And let it drip. And lick it. And pour more ganache over it. Is so much better if it’s still slightly warm (God this is too much for me, I need more sour cream ASAP) I think I probably just ate the entire thing by myself, since some of my friends thought it was a tad too strong. For me, it was perfection. I think it could be for you too. In a small sauce pan, melt the butter until it is a deep golden brown color. There will be charming little brown bits at the bottom of the pan. You don’t want it too burnt, otherwise it’ll taste, for lack of a better word, weird. Add the half and half and heat until scalding (not quite boiling). In a separate bowl, whisk together the sugar and egg yolks until pale and fluffy. Take the half and half mixture off the heat, and add a little to the egg mixture while mixing. This is called tempering the eggs: introducing hot liquid a little at a time to eggs while stirring, as to not cook the eggs with the hot liquid. Add a little more (just over half of the hot mixture total) and the healthy pinch of salt, then pour everything back into the sauce pan. Heat, stirring very often or constantly, until about 170 degrees, or until it coats a metal spoon. Transfer the mixture to a bowl and chill. Once the mixture is chilled, whisk in the additional 1 1/2 cups of milk and add it to your ice cream machine. 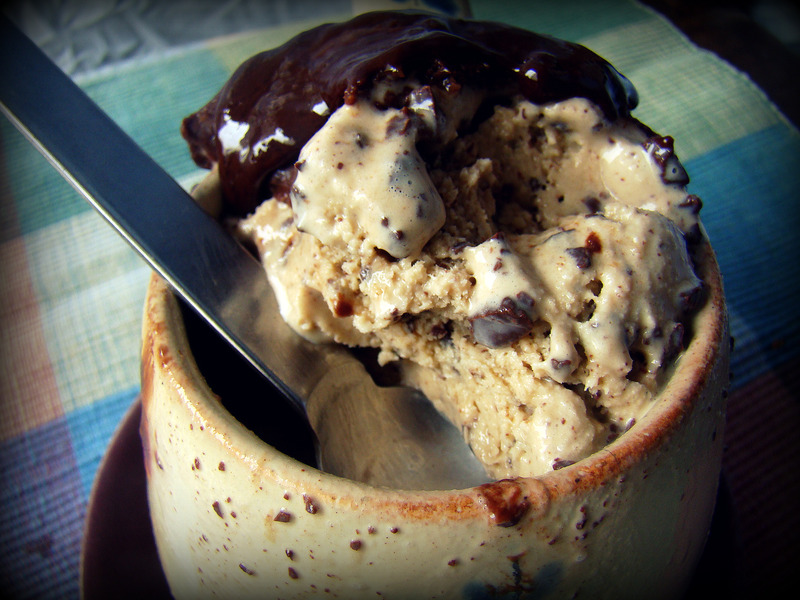 When it’s almost fully churned, add your chopped chocolate. 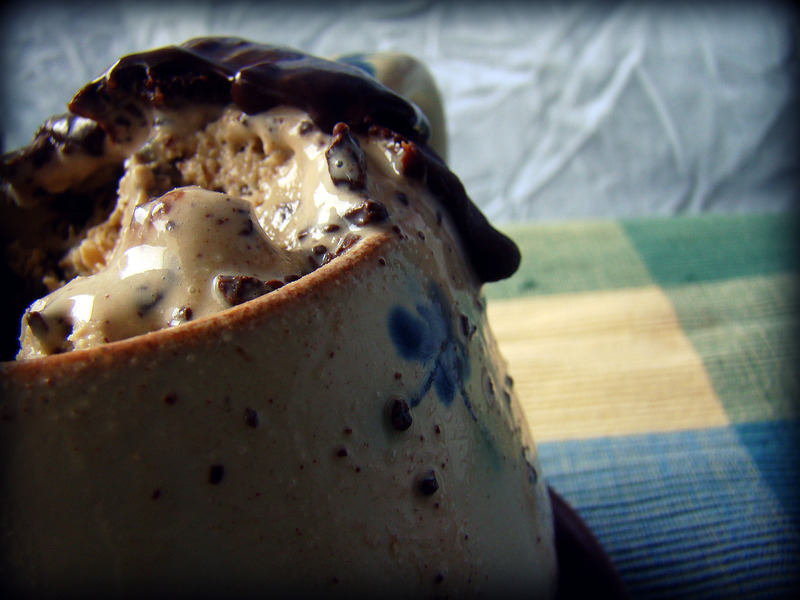 Eat directly from the ice cream maker or freeze overnight. Melt the chocolate and brown sugar either over a double boiler or in a microwave-safe bowl. When the chocolate melts, stir to dissolve all the brown sugar you can (it doesn’t have to be perfectly smooth) and then add to the sour cream along with the vanilla extract and mix very well to incorporate. You can use right away or let it set. « Nothing clever, just Pizza. 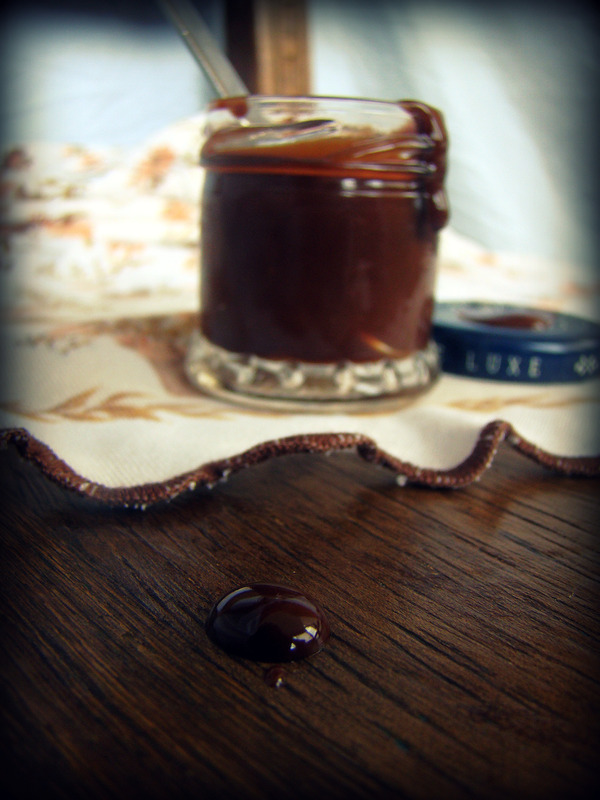 Ooh, I love that picture of the ganache- yummy! LOVE IT. 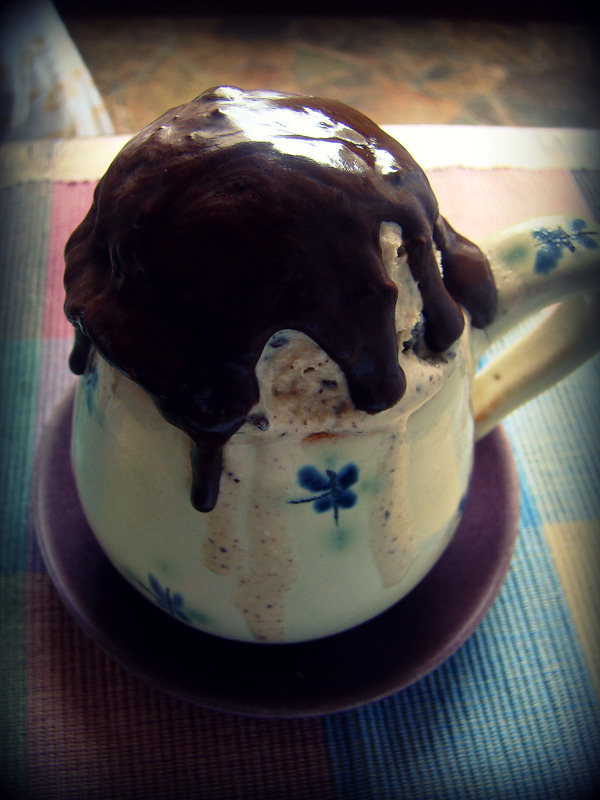 I love ice cream, you just can’t make too much of it. Don’t ever feel bad for writing about ice cream too much, no such thing IMO. Also, what fantastic pottery! Thank you! I do think that you can’t have too much ice cream! I found this lovely cup in my mom’s old tableware pieces and I loved it! I’m thinking of using it more here. Thanks again! My gosh, this looks so amazingly good! I’m going to have to make this ice cream in the near future! 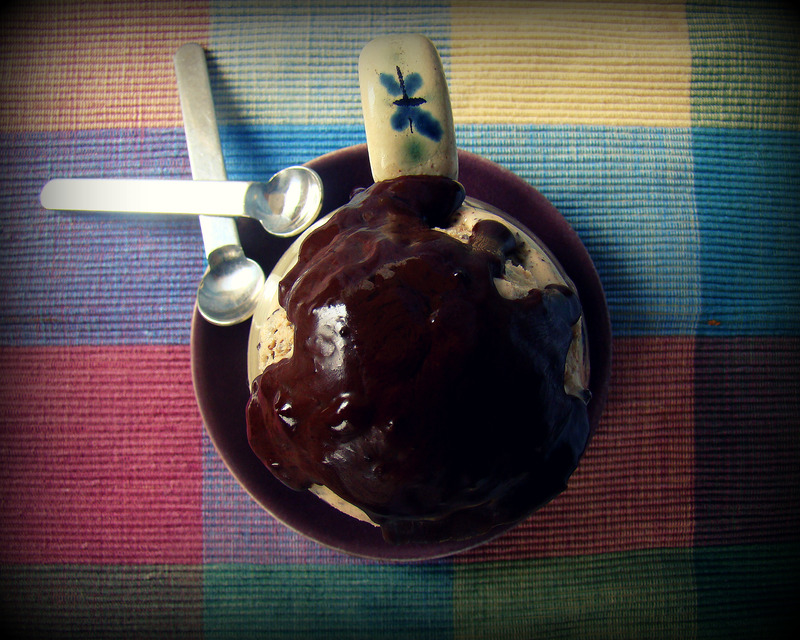 I managed to get the ganache super gooey and put waaaay too much chocolate in the ice cream. Thanks a bunch and keep up the good blog! that is so great! Iam so glad you liked it! it looks greaat!